When I saw a Medallion log cabin by Tanya , I knew that I wanted to give it a try. 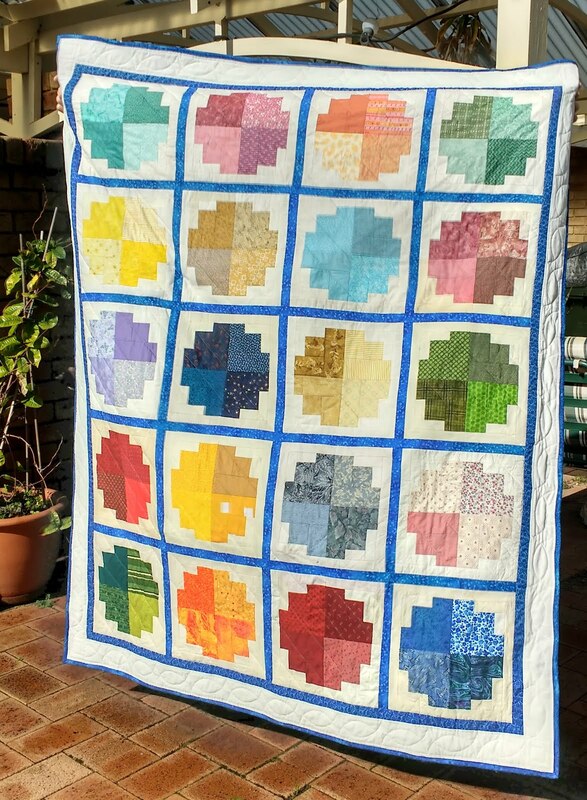 Its a great way to use up scraps (especially if you have left over jelly rolls or 2 1/2" strips) and the blocks come together quite quickly. The cream/background colour you choose strips are narrower (1and half inches). The weather hasn't been too good here so this is first of all an indoor shot, demonstrating that I couldn't fit it all in! Its a single bed size. 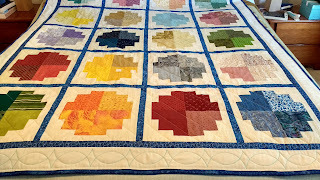 What's visible here though is the fun border quilting I did (thanks to Joanne). I made my own template (using templastic) and drew on the half circles first of all on the bottom half of the border, then overlapped them from the top half - creating those lovely diamonds where the half circles cross one another. 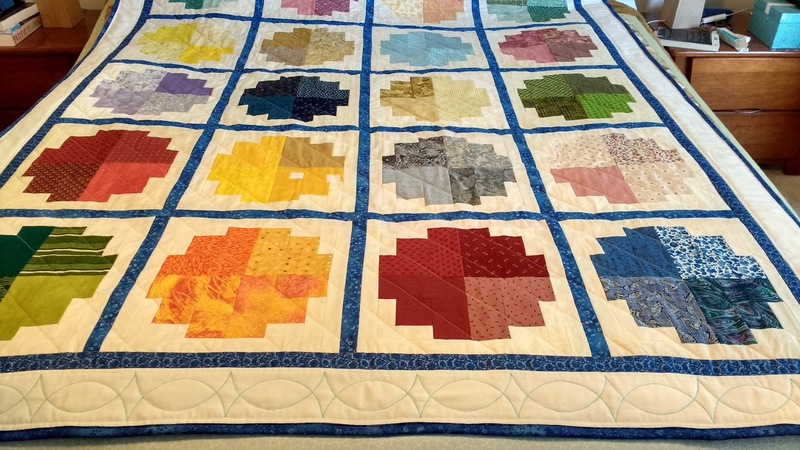 And I did all of the quilting using a walking foot. Normally I would use my free-motion darning foot, but a walking foot does give a very even stitch length which I was happy with here on the cream border. Maybe I'll get brave sometime and use a coloured thread but at present I stick with cream on cream. With the remainder of the blocks, I wanted the colours to speak for themselves, so thought a simple diagonal line would work just fine. This is another for my mother-in-law who has an event later in the year where her group has country people gather together ( I think it's a Weightwatchers group but mostly social for her) and they have a raffle. I hope it raises some worthwhile funds for them for their hall hire etc. 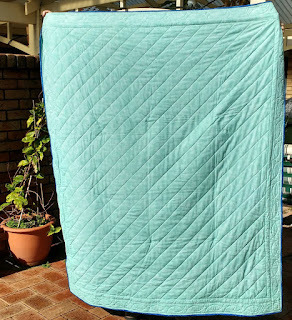 Anyway as a result, she chose and paid for some wide backing fabric (thank you!) 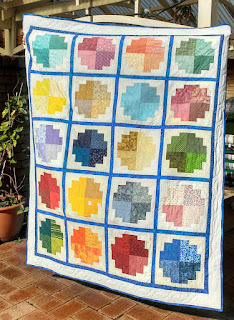 that has worked well with the two quilts (see previous post Friendship Stars) that I've done for her. 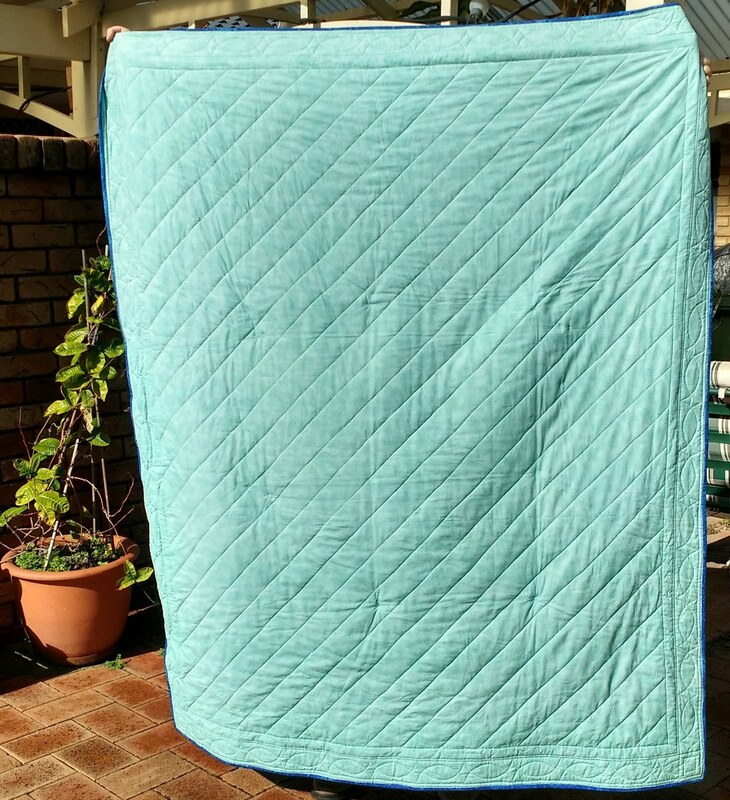 Here's the backing a kind of pale turquoise colour. Thread: Rasant Cream and Pale Grey both top and bobbin. Its a very satisfying feeling to know that it's done! Now on to that increasing WIPs list. This is cute--may have to try it!